If you sat down and made a list of the greatest National Football League franchises of all-time, you'd probably run through a few teams before you landed on the New York Giants. Just off the top of our heads, it would seem like squads like the Green Bay Packers, the Chicago Bears, the Dallas Cowboys, the San Francisco 49ers, and even the Oakland Raiders would belong ahead of the G-Men. But the truth is that the Giants belong not just on that list but pretty damn close to the top of it. Since joining the NFL back in 1925, five years after the birth of the league, the franchise ranks third all-time in the number of NFL titles won—four prior to the Super Bowl era and three since the creation of the big game. And because of it, the Giants have racked up plenty of great moments in their franchise's storied history. From their first 'chip all the way back in 1927 through their most recent victory against the New England Patriots in Super Bowl XLII, Big Blue has put together a highlight reel that's as large as its' name suggests. So with the team getting ready to try and make history again in a rematch against the Pats in Super Bowl XLVI this Sunday, we put them all together right here. 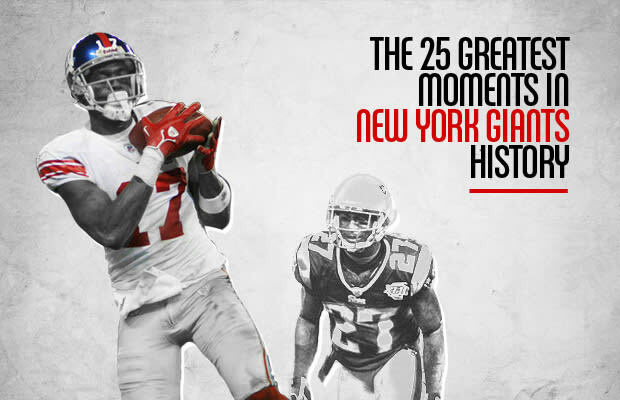 We already gave Pats fans something to get excited about, so here's one for all the supporters of the G-Men: The 25 Greatest Moments in New York Giants History.